We've just release a new build of AutoTweetNG Joocial v6.7 Beta, with support for VK Profile and VK Group channels. 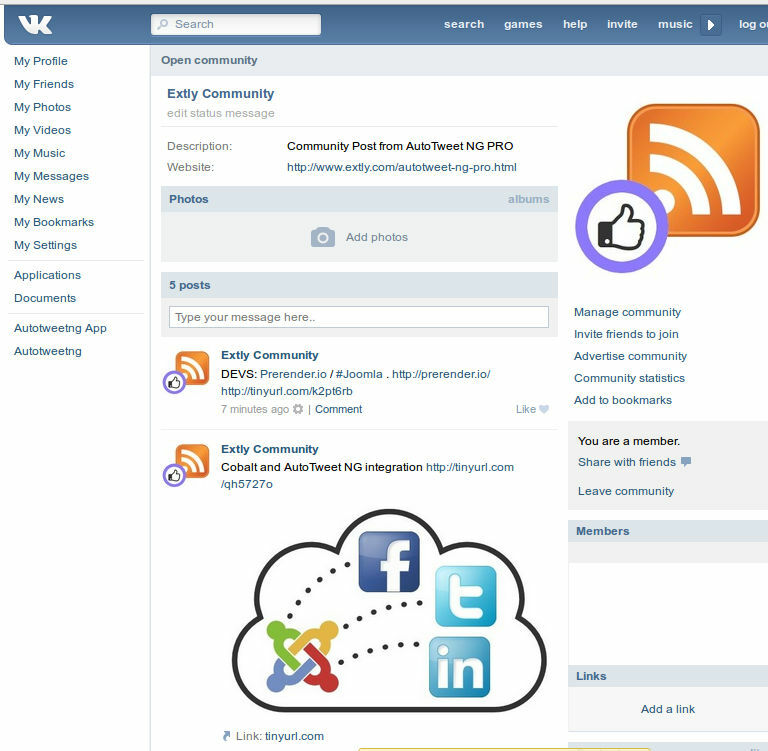 VK (originally VKontakte) is the largest European social network with more than a 100 million active users. It's available for download from your account. Now, included in AutoTweetNG PRO, we have two more plugins to celebrate! Cobalt Joomla CCK plugin: Cobalt 8 opens incredible possibilities for constructing your website, and allows you to build almost anything, among others: File Downloads, Galleries, Blogs, Forums, Support Desks or Private Ticket Systems, Real Estate, Auto Markets, Job Boards, E-Commerce Product Catalogs, and other kinds of listings, reviews, discussions, bulletins, etc. Now all of them are integrated with AutoTweetNG! JoomGallery plugin: JoomGallery is a gallery component completely integrated into Joomla! Now, when a new image is created/uploaded, it's posted to your social channels. To access the new plugins, just download the very same AutoTweetNG v6.6.1 from your account. New AutoTweetNG Joocial is coming! AutoTweetNG Joocial is coming to provide a full life cycle support for Social Media Content Management (SMCM). 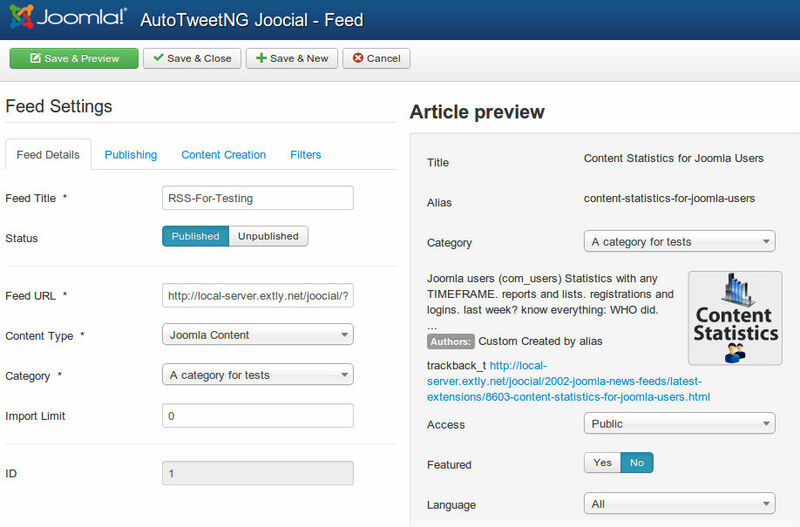 Now, we are releasing AutoTweetNG Joocial Beta1 v6.6.1 with RSS Feeds grabber for Automatic Articles. It's available now for AutoTweetNG PRO & Extly Club memberships. Content Creation: Text Edition & Validation, Links, and Trackback Links. Filters: Duplicates check, Import Filters, HTML Filters, and Text Filters. Developed with FOF - Framework on Framework. Based on the venerable FeedGator v2.3.7 for Joomla 1.5. Next version of AutoTweetNG is coming with a great new feature to nicely improve your community news: RSS Feeds Import. We've been testing the concept in our Joocial.com site, loading relevant Joomla news from RSS Feeds, and re-publishing to our Facebook, Twitter, and LinkedIn channels. And, now, we are adding native support for RSS article generation, combined with posts from Joomla to social channels like Twitter, Facebook, LinkedIn and more. Libraries SimplePie v2.3.7, Readability v1.7.1, and htmLawed v1.1.15. One year ago, we launched Extly.com. Time flies! It's hard to believe, but one year ago we launched Extly to exclusively commercialize, develop, and support Joomla! extensions. Based on our consulting experience working in Prieco, our former company, we begun improving our extensions to give them a product-oriented vision. At the same time, we added 1st-movers's extensions to the family. We've renewed products to support Joomla! 3, SobiPro v1.1, JomSocial v3.0, and all the supported extensions latest versions along the mobile devices revolution. We've launched AutoTweetNG v6.5 with a whole new social model, and ready for new challenges. Our aim focused to provide state orf the art Social Management for Joomla!. We've reorganized all of our SobiPro and JomSocial extensions as a single new solution XTDir. XTDir for SobiPro - Extend your directory: A Unique Solution to empower SobiPro! XTDir is a new extension to manage and extend SobiPro as never before! Manage, featured, and promote entries. Search modules, and more! XTDir for JomSocial - Business Pages: All required extensions to build a Business Pages Directory! XTDir Business Pages is a new solution to manage and extend JomSocial and Sigsiu's SobiPro as never before! Create a full Social Network, community + business directory. We've been witnessing an amazing growth, beyond our wildest expectations. This year we renew our commitment to provide greatest products and outstanding support. Thank you for encouraging our continual quality improvement! What is XTDir for SobiPro? XTDir is our new solution to empower SobiPro! XTDir is built based on our 5-years experience working and extending SobiPro (formerly known as Sigsiu Online Business Index 2, or Sobi2 for short). From our humble beginnings, with the SobiPro Search plugin, we 've been creating new extensions for SobiPro, supporting new features and extending Apps, Modules, and Plugins. Joomla Search plugin: To integrate SobiPro with the general search. Smart Search plugin (Finder): To integrate SobiPro with the general Joomla smart search / simplified Sobipro App for finder. Entries Explorer: The explorer is our main management tool to promote/unpromote, enable/disable, and approve/unapprove actions. Promoted Entries: Entries can be promoted to top positions in the catalog navigation, in this way an advertisement organization can be implemented. 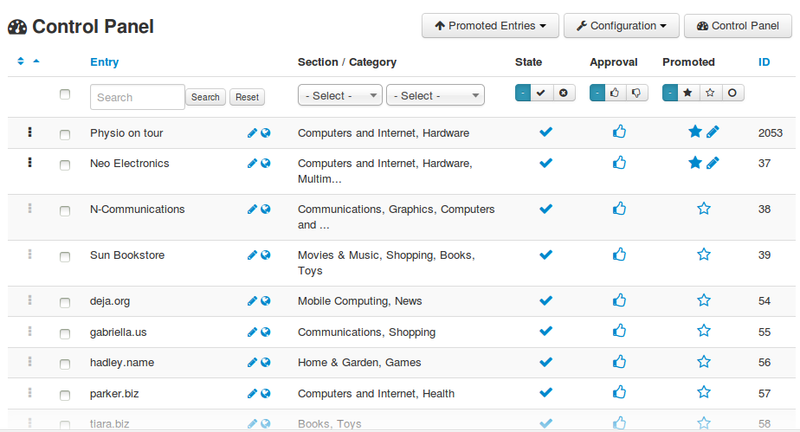 Tiers for Sections / Categories: Tiers define how the list of promoted entries will be managed. Scope: section-wide or category specific. Entries management: Manual (activated by hand), Dynamic (field managed) , or Paid (activated by payments). Extended Joomla Search Form: the extended search form applied to Joomla search. Extended SobiPro Search Form: the extended search form applied to SobiPro search. Categories of SobiPro: module to show the list of categories, in 6 different layouts, with statistics. Joomla Search In Categories: module to show a seach box, and an associated list of categories for Joomla search. SobiPro Search In Categories: module to show a seach box, and an associated list of categories for SobiPro search. Sobipro Search in Selected Section: module to show a search box and a section selection, to submit the query to SobiPro search. Cronjob tasks: heavy tasks are managed by cronjob tasks. For example, to build an index of 1.000 entries, 100 seconds are required. In this edition, JCalPro, the events calendar for Joomla, is the new featured AutoTweetNG plugin of the month. JCalPro offers simplicity, flexibility, a robust feature set and gorgeous templates to fit almost any color scheme. Fix in SobiPro plugin category support, v6.4.3. XTDir Alpha 1 for SobiPro is out! AutoTweetNG, a bigger social hub, and also SobiPro news! About Security Practices: Warning! Don't download extensions from untrusted websites!